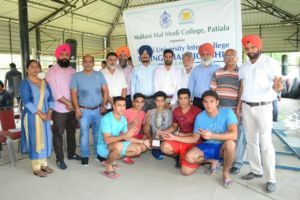 Three Day Punjabi University Inter-College Boxing (Men) Championship hosted by M M Modi College, Patiala concluded here today. Sh. Upkar Singh, Dist. Sports Officer, Patiala was the Chief Guest on the occasion. He urged the participants to appreciate the role of sports in making the society tolerant and a happy place to live in. He lauded the contribution of M M Modi College and its sports persons in the field of sports. He congratulated College Principal, Sports Dept. and their sports persons for winning the tournament. Principal Dr Khushvinder Kumar welcomed the Chief Guest and other dignitaries. He congratulated the sports department of the college for the successful conclusion of the championship. He also thanked the Officials Punjabi University, NIS, Patiala, Punjab Sports Department and College Medical Officer Dr. Kewal Krishan for the help they extended in the organization of the event. He said that sports play an important role in improving the physical and mental health of the youth and keeps them dedicated in furtherance of their careers. Varinder Singh of M M Modi College won the first place by defeating Gurbax Singh of Govt. Mohindra College, Patiala and Reyal Puri secured first position by defeating Gagandeep of Govt. Rajindra College, Bathinda. Varinder Singh and Reyal Puri have also performed very well in International Boxing Competitions. Dean Sports, Dr Gurdeep Singh said that competitions were held in 10 categories. M M Modi College is declared the overall Champion of the competition with 38 points whereas Govt. Ranbhir College, Sangrur was declared second with 15 points. Desh Bhagat College, Dhuri was declared third by securing 12 points and Govt. Rajindra College Bathinda stood fourth with 9 points. Sh. Harpreet Singh, DSO, Fatehgarh Sahib, Sh. Tarsem Lal Gupta, Chief Coach, NIS and S. Jaswant Singh, Chief Coach (Boxing) played key role in organizing this tournament. Principal Dr. Khushvinder Kumar congratulated Prof. Nishan Singh, Head Sports Department and Prof. Harneet Singh and Prof. Mandeep Kaur for this achievement. Large number of students and teachers were there to applaud the performance of the pugilists.